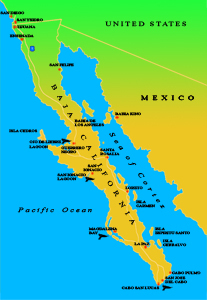 The Baja California peninsula is a vast territory stretching for nearly 1100 miles South from the border of San Diego California, USA with Tijuana, Baja, Mexico. It is almost as long as the west coast of the US but the average width of the peninsula is only 50 to 75 miles. Baja is largely an untouched and sparsely populated desert wilderness stretching from the cold waters of the Eastern Pacific to the warm water currents from the southern hemisphere that feed the nutrient rich waters of the Sea of Cortez. The East coast of Baja is bordered by the Sea of Cortez, supporting the largest and most varied population of whales in the world as well as one of the last sanctuaries for the endangered Fin-back and Blue whales, the largest of the cetaceans (twice the size of the Gray whale). 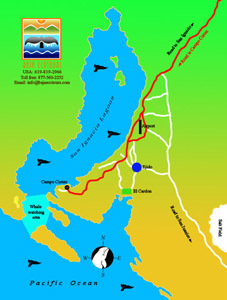 With only one two lane road and three small international airports serving the entire peninsula, Baja is truly the last unsettled frontier in North America with an unprecedented record by the Mexican government for its efforts to protect and preserve the marine mammals and fish that reside and migrate into the protected waterways of Baja. 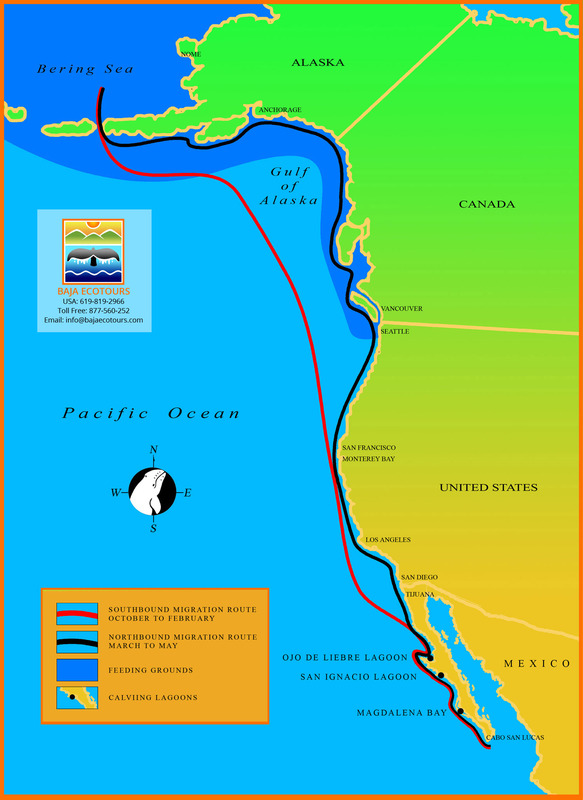 The Migration route of the Pacific Gray Whale is often described as the longest known mammal migration in the animal kingdom. Beginning in the Bearing and Chukchi Sea and ending in the warm water lagoons of Mexico’s Baja peninsula, their round trip journey moves them through 12,500 miles of coastline. This journey begins mid to late September as the northern ice pushes southward. Traveling both night and day, Gray whales average approximately 80 miles per day (120km). By mid to late December the majority of the Gray whales are usually found between Monterey and San Diego where they are often seen from shore. 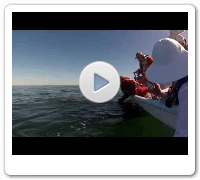 By late December to mid January the first of the Gray whales begin to arrive the calving lagoons of Baja. These first whales to arrive are usually pregnant mothers that look for the protection of the lagoons to give birth to their calves. Finally by early to mid February the bulk of the Gray whales begin to arrive and begin the cycle of life … giving birth to their young and mating. It is from mid February till late March that the lagoons are typically filled to capacity with nursing, calving and mating Gray whales. Throughout February and March, the first Gray whales to leave the lagoons are normally the males. Once they have mated, they will begin the trek back north to their summer feeding grounds. Pregnant females and nursing mothers with their newborn calves are the last to leave the lagoons. They leave when their young are ready for the journey which is usually from late March through Mid April. Often there are still a few lingering Gray whale mothers with their young calves in the lagoons well into May and June. 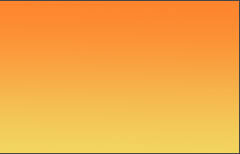 The date ranges given are meant for San Ignacio Lagoon only. Gray whales at Magdalena Bay to the south often leave a month earlier and often come into San Ignacio Lagoon and Scammons Lagoon where they spend a bit of time for unknown reasons. Located at the center of the Baja peninsula between the Pacific Ocean and Sea of Cortez or Gulf of California lies Mexico’s most dramatic and diverse wildlife refuge. It is called El Vizcaino Biosphere Reserve and it is one of Mexico’s most recent additions to a growing collection of wildlife and protected zones. 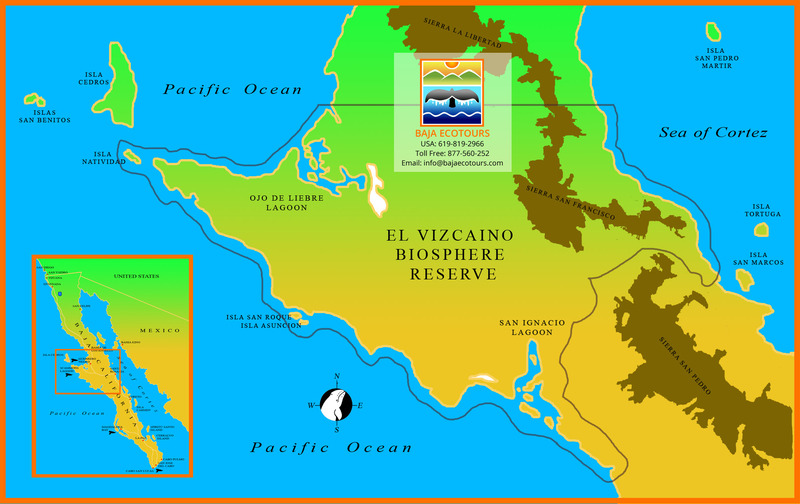 Declared a national biosphere in 1988, El Vizcaiono has a landmass of over 2.5 million hectares (143,600 square km) it is the largest wildlife refuge in all of Latin America and certainly the most diverse. This region was first inhabited over eleven thousand years ago by the Cochimi, nomads who came from the north of the American continent. These nomadic wanderers lived in the protection of caves in the Sierra San Francisco mountain range where cave art can still be seen by travelers making the trek into this mountainous region. Unique only to Baja. The animals and plants of this territory have adapted themselves to the region’s extreme desert conditions with little rainfall, intense winds and an ecosystem which has produced thousands of endemic species of plants and animal life found no where else in the world but Baja. Animals that have adapted to these extreme conditions include a variety of nocturnals such as coyotes, rodents, and hares; others have adapted to only ingesting water from succulents. Outstanding among the mammals is the pronghorn antelope, one of the swiftest mammals on Earth. In this region can be found the last populations of Antilocapra Americana Peninsularis, an endemic subspecies of the pronghorn. The Vizcaino is also the habitat of the desert bighorn sheep, the mule deer, dozens of resident and migratory birds—being of special importance the ospreys, cormorants, herons, and gulls—and four species of sea turtles. On the coastline and islets there are many marine mammals, such as elephant seals and sea lions. But what is most spectacular, what gives this region uniqueness found nowhere else on this planet, is that it is the birthplace of the Pacific Gray Whale commonly known as the California Gray Whale. Every winter, thousands of Gray Whales migrate from their feeding grounds in the Bearing Sea and Alaska to the lagoons of San Ignacio and Ojo de Liebre and Magdalena Bay to mate and bear their young as they have done for thousands of generations. Inscribed on the World Heritage List in 1993: Because of its’ uniqueness and importance to the world community, UNESCO the United Nations Educational, Scientific and Cultural Organization has designated the cave paintings of the Sierra San Francisco and the calving lagoon of San Ignacio as World Heritage sites. 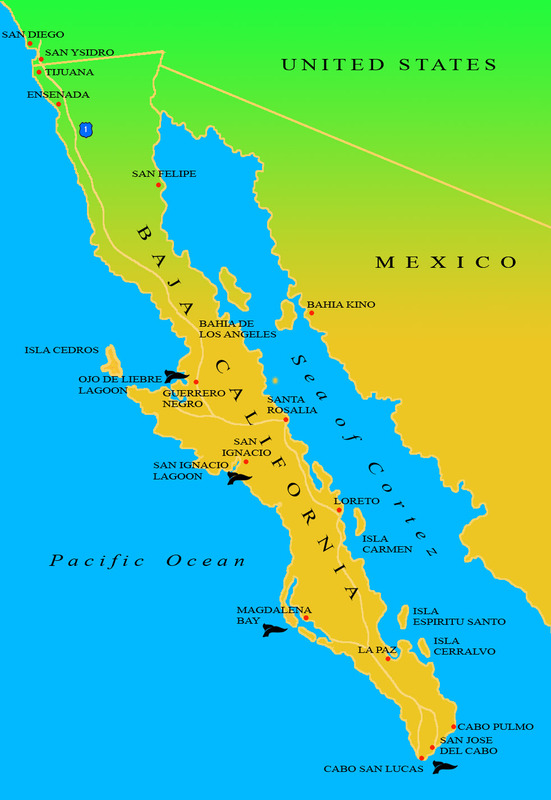 San Ignacio lagoon was originally discovered by whaling captain Jared Poole, brother-in-law to captain Charles Mellville Scammon. 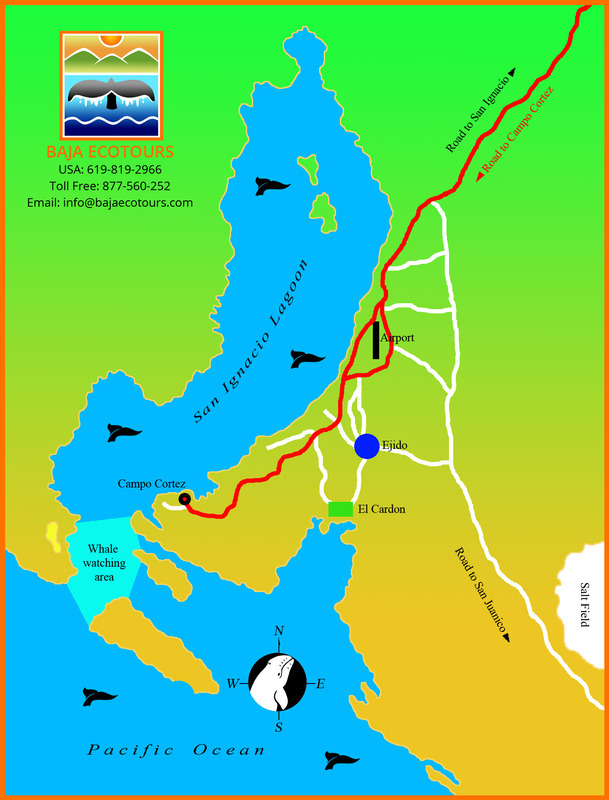 The first whaling expedition to San Ignacio Lagoon occurred in 1860 led by Scammon and six whaling vessels. 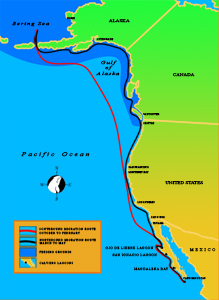 Although many whaling captains would not risk loosing their ships to the treacherous sand bar shoals and narrow shallow water passage into the lagoon, enough bold whaling captains did and the beginning of the near extinction to the Eastern Pacific Gray Whales was on its way. The lagoon is located 59 kilomoters (36 miles) from San Ignacio and Hwy.1. With a local community of less than one hundred inhabitants, the lagoon residents depend primarily upon fishing and now whale watching as their primary means of support. The lagoon stretches into the desert by about sixteen miles and has a maximum width of five miles. The lagoon is divided into three sections. The upper lagoon is the shallowest part and is known as the birthing area where pregnant females travel to in order to bare their young. At the middle lagoon you find mothers traveling with their newborns as the tides flow in and out getting their calves ready to join the majority of the whales at the lower lagoon. At the lower lagoon, you find the majority of the cetaceans and this is where most of the social behavior occurs. Here, males and females congregate looking for mates. In addition newborn calves with their mothers travel the length of the lower lagoon preparing themselves for the long journey north to their summer feeding grounds in the Arctic. In 1988 Mexico established the Visciano Biosphere Reserve to include San Ignacio Lagoon, which is Latin America’s largest wildlife sanctuary. Not only is San Ignacio lagoon a gray whale sanctuary, but it is the last and only undeveloped nursery and breeding ground in the world of the Pacific Gray Whale. San Ignacio lagoon is also the critical habitat for the near extinct prong-horned antelope and an important feeding habitat for four of the worlds seven species of sea turtles: leatherbacks, hawksbills, green turtles and olive ridleys (all endangered). In 1993 the United Nations declared San Ignacio lagoon a World Heritage site because of its importance to the world community.